Director: Larry Charles. Cast: Sacha Baron Cohen, Ben Kingsley. Heralded by a strong marketing campaign that makes it sound as the most controversial movie since the last temptation of Christ, The Dictator is a strange hybrid. It is certainly not what the trailers makes it look like, nor is as innovative as Sacha Baron Cohen‘s best work (well… so to speak… I guess I’m referring to Borat, which is no masterpiece but at least it felt new at the time). I call this a strange hybrid because in trying to be both controversial and a crowd-pleaser, rude and cute, clever and silly, in the end might just dissatisfy pretty much everyone. This time the documentary style from both Borat and Bruno has been abandoned in favour of a more straight forward and linear structure. But while there are undoubtedly some inspire puns and good ideas here and there (right from the start the mother dying in child-birth), the story (or rather lack of one) is so idiotic and pedestrian that leaves those few good jokes too exposed and definitely not enough to keep you engaged even if the overall length movie is pretty short. Believe me, I’m all in favour of good satire and I’m certainly not one of those who claim we should not joke on delicate issued like racism, xenophobia, terrorism and Arab (or Western) stereotypes and preconceptions. If it’s done with a purpose and if it’s clever, it can be as sharp as a knife and quite effective. Sadly here, you can just see sporadic glimpses of what this film could have been, had it not fallen into the trappings of a thin love story. Four Lions tried it last year: it was not completely successful, but it was a noble attempt. Here, the satirical edge of the Dictator is too diluted among cheap slapstick and unnecessary interludes, extraneous to the central message (the masturbation sequence for example, rude for its own sake, was just cheap and unfunny in my book, just to mention one… Just being rude for the sake of being rude should really not be the purpose of such film. Leave that to Apatow). 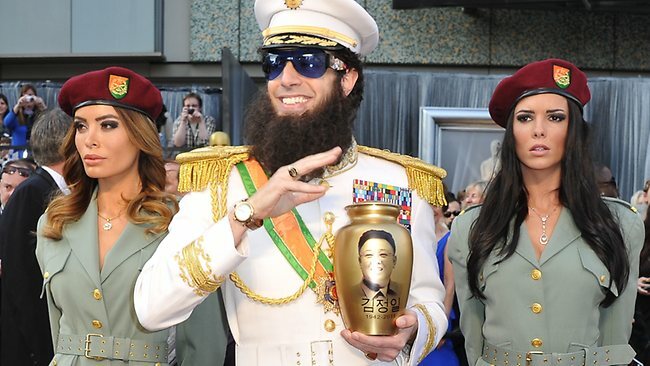 The Dictator was so desperate to offend and be controversial that it forgot its main purpose: to be funny. In the end it just fell flat. This is certainly not Dr Strangelove, but it’s not South Park or Team America either. It’s just a collection of gags, some more successful than others; a sort of modern-day (and more polished and slick) Kentuky Fried Movie (and let’s not forget that even that one is NOT a good movie! ).In theory there is nothing wrong comedies made up with a series of gags all stringed together by a silly story. Look at Airplane! But at least on that one the gag rate was so fast that all you did is laugh… here the laughs are too few. hi movie-geek, glad to see you back “in action”. it’s a pity you did it with such a useless film. anyway, we all have to start from somewhere..
i just want to pooint that you confused “kentaky fried MOVIE”, with “kentaky fried CHICKEN”. is it possible to correct that? i suppose that readers not from our generation would be less confused. and i mis-spelled “kentUky” my!! i am so tired….